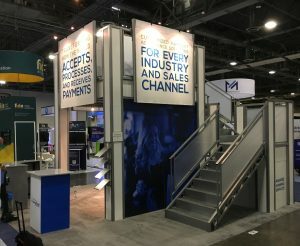 With over a dozen years of experience as a distributor for an industry-leading Double Deck display manufacturer, we are your source for unique, extremely fast yet cost-effective solutions. We offer turnkey rental solutions nationwide, as well as new display sales. Professional I&D teams provide you with a worry-free alternative. 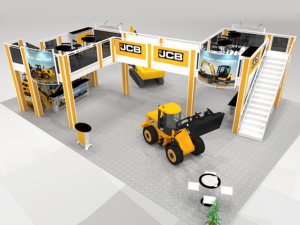 All our Double Deck Displays are pre-approved with convention facilities across the nation. Show us a qualified lower price for any of the two story displays we offer, and we will beat that price, guaranteed. We partner with you to ensure the display meets or exceeds the functionality in advance of your review on the show floor. As a special bonus, all graphics we provide are delivered to your show, and installed at no additional charge. All ceilings are finished – no visible structural elements. We include adjustable track lighting. Stair and railing panels are frosted acrylic with available custom printed hard panel graphics. Our double deck displays provide a 9’ ceiling height – Superior to low-quality alternatives. all of these can be used to help us create your perfect solution. Our Double Deck displays aren’t limited to a few basic designs. If your booth size is a bit unusual, we can craft a unique solution. 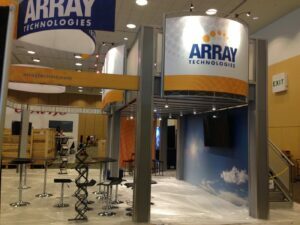 Booth sizes for a double deck display begin at 20×20. Be it an island configuration, or peninsula, we’ll help you make the best use of the space you have, while honoring your budget. Contact us at (888) 467-7696 or request additional information.